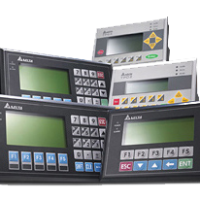 Delta’s HMI provide various communication ports for fast communication and convenient control of a diverse range of machines, systems and facilities. 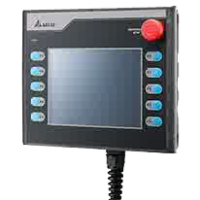 The color touchscreen enables intuitive parameter entry and a variety of ways to display variable data, including trend graphs and alarm elements. 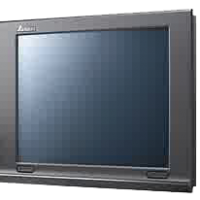 The high resolution LCD display visualizes operating, monitoring and efficient control in real time. In addition, the user-friendly editing software guides users in quickly creating easy-to-navigate visual icons and easily designing intuitive monitoring screens for applications, while making adjustments, scheduling, and programming operational sequences that enhance flexibility and save development time. 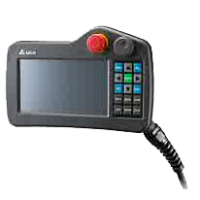 This achieves rapid system development that simplifies wiring and installation, saves operating expenses, and makes systems more efficient, eliminating time-consuming adjustment and additional maintenance costs. 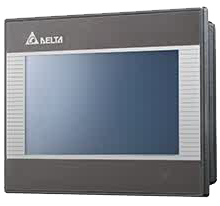 The 4-Line Text Panel HMI with Built-in PLC TP04P Series’ adopts a built-in DIO/AIO and combines the functions of a programmable logic controller and touch panel in one device. This series’ screen displays text or messages with four lines at the same time. The TP04P Series is lightweight, flexible in use, provide easy-to-control operation, and also support various communication protocols.